My wife’s wedding dress was sewn the morning of our wedding. It seemed odd then, but if we were were to have a wedding ceremony today I would expect it. These details reveal much about her and they reveal much about us. How we navigated the wedding could serve as a blueprint for how we handle most situations in life. The strengths and weaknesses of the planning process continue to be our strengths and weaknesses more than a decade later. Some believe this truth in an old wive’s tale fashion: if it rains or something goes wrong at the ceremony, they believe the marriage is cursed. That concept is crazy. Rain at a wedding doesn’t curse a marriage. However, how a bride and groom respond to their plans being thwarted can greatly predict the future of their relationship. A groom once called off the wedding weeks before the ceremony. His reasoning—he was afraid he couldn’t afford the bride. While he didn’t have to pay for the wedding, he watched how his bride interacted with her family and the expectations she had. He wanted to get married; she wanted to put on the most expensive show in town. While he didn’t have to pay for the wedding, he knew he would have to pay for her lifestyle after the wedding. While he had a good job, his job did not compare to the income the bride’s parents earned. If the wedding planning was a foreshadowing of the marriage, the groom realized he couldn’t afford his wife so he called off the wedding. When it’s time to say, “I do,” it’s okay to say “I don’t” if there is any doubt. The preparations for the wedding ceremony can give a couple great insight into each other (and one another’s families). On rare occasion it might motivate someone to call off a wedding, but more often it should cause a couple to realize where their problem spots might be and to work on them. If a bride freaks out over a small issue like the flowers not being right, how will she handle a miscarriage or job loss or a mistake by her husband? If a groom is unaware and uncaring toward his bride during the planning process, will he suddenly become a thoughtful and compassionate partner when children are born? If the mother-of-the-bride is overly involved in the wedding planning process and forces her way, do you believe she will suddenly mind her own business when you are married? If your families don’t get along for the wedding, what will holidays be like? 1. Pay attention. While the engagement process should not be approached as a test, a couple should continually be evaluating themselves and their relationship. Since we expect to have disagreements and problems, a healthy couple can use the wedding planning process as an incubator to reveal problems. 2. Deal with it. The problem I see with many couples is they push aside issues and ignore them. When a problem arises in the dating or engagement process, a couple should nip it in the bud. They should recognize the issue, discuss it, and either handle it on their own or seek help from a professional. The earlier a couple can deal with an issue, the better off the couple will be. If you are in a relationship, dealing with problems should not be saved for a later date. Growing in intimacy and friendship requires every couple to face difficult issues and learn from them. If you do not start the process now, you likely never will. If you are married, consider the most common problems you have had in your marriage. Were there small signs during the engagement process that those would be the problems? Great comparison! I love the look on your face Kevin as you look at your Bride. Brilliant as usual. 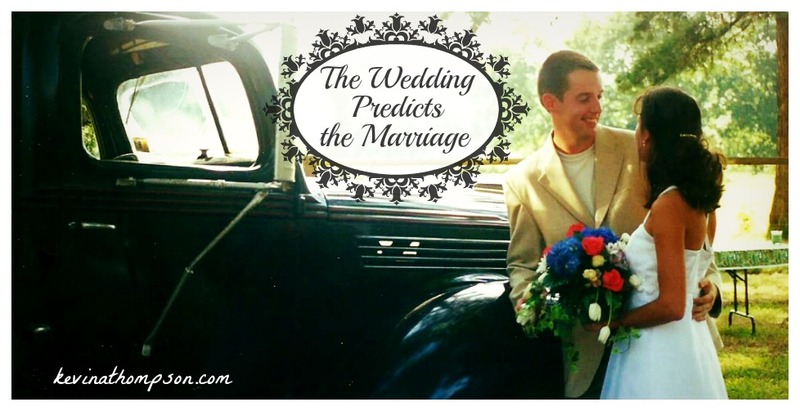 Sadly, I look bad on my wedding day and so much of what happened that day predicted the outcome of my marriage. I’m recently divorced and it’s taken me about a year to realize that our wedding was a reflection of how wrong we were for each other.